I lived in Jamaica twice. First from 1973-1975 (yes - the good old days). I lived in the 'bush' with no electricity, no running water (we walked through the cane fields for our water from a spring), no job, no responsibilities. When I returned to the US I was never really happy in 'civilization,' and so I eventually returned in 1991 and stayed until 1997. The big difference this time was having my young son with me - he was aged 4 when we arrived - 10 when we left. I once again made my home mainly out in the country places - walked to a spring for water again. But this time I did work - in hospitality and environmentalism. The photo I've uploaded is a sunset in Negril. If you look closely, you'll see the line of buoys installed as part of the Marine Park. I worked for the Coral Reef Society and also the Environmental Protection Trust while I was there and assisted the late Katy Thacker in her work to get funding from the European Union to fund the Marine Park. This was the first time an NGO (non-governmental organization) had ever received funding from the EU. Thanks, Katy! I love seeing the photos here on this website - I sure do miss Jamaica!! My Garden of Eden. Who knows - I may return some day. I never liked acting like a tourist after living there, though. Miss the food, fruits, smells, slow pace of life, freedom I had there, and the warm climate. I had to stay in Florida after I came over since I couldn't stand to live in cold again! My time in Jamaica was a huge part of my life and the good friends I have now are friends I made there. Thanks for the opportunity to share. We most likely met as well, if you were with NRCA. I was with NCRPS from about '92-'97. Katy passed on Earth Day - rather appropriate, I think! She watches over the reefs from another level now! I met Katy Thacker while I worked at the Natural Resource Conservation Authority. She was really dedicated to Negril Coral Reef Preservation Society. Regretably, I heard that she passed away. 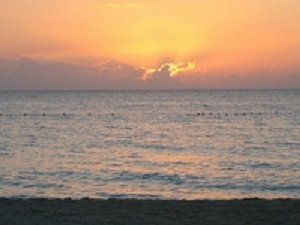 Your photo of the Negril Sunset is just awesome.